While translations provide an opportunity to read books that would otherwise be inaccessible, there are some that one feels ought really to be read in their original language. 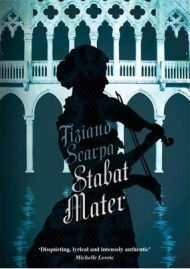 As beautiful as Shaun Whiteside’s translation reads, I can’t help feeling that Tiziano Scarpa’s Stabat Mater is one of those novels. The story is told through Cecilia a sixteen year old orphan who lives in Venice’s Ospedale della Pietà’ she earns her keep as a violinist in the orchestra that plays in the church next door to the orphanage. The musicians and singers of the orphanage perform from a hidden gallery within the church. Cecilia is clearly a troubled young woman; she rises during the night to write letters, which are never sent, to her unknown mother and it is through these letters that we learn about Cecilia’s worries: there is a recurring internal dialogue with a strange snake-haired woman who embodies Cecilia’s dark thoughts about death, and there are indications too that Cecilia suffers from some kind of eating disorder. Combined with these more abstract elements of the novel are rather more conventional journal extracts which describe events in the Ospedale, most notably the excitement around the arrival of a new composer, Don Antonio – more usually referred to as Vivaldi. The young composer announces his arrival by presenting to the young musicians some compositions he has created, inspired by the four seasons. The girls are charmed by the new arrival, especially Cecilia who finds in Don Antonio a sympathetic ear and a chance to escape her sad existence. Stabat Mater is a highly poetic piece of writing; one might suggest ‘novella’ as best describing it and it is indeed short enough to fit that description but for me it is simply too impressionistic and too patchy, to constitute a whole ‘story’. There are elements that suggest that a fantastic story might be in the offing: a fascinating location, the presence of a well known ‘real life’ character and the intriguing world of the orphanage. We do learn a bit about some of the other girls but these stories are all too brief; so, too, is there disappointingly little about Venice. The story focuses so much on Cecilia’s state of mind that the opportunities to create a really vivid portrait of Venice are squandered. Had Cecilia been a more likeable character I may have forgiven this, but she comes across as weak and self-pitying and this added to my frustrations with the book. Parts of this novella are beautiful. The author Tiziano Scarpa does a wonderful job of conveying the power of music to affect the emotions. Before Don Antonio arrives at the Ospedale the girls have been playing the same tired music written by the previous jaded in house composer; the new composer’s works have a profound effect on the atmosphere at the Ospedale, and when he appears in the story there’s a sense of the picture being imbued with colour where previously there were only shades of grey. For me one of the most interesting ideas of Stabat Mater is also one of the most disappointing. The unconventional structure of the narration allows us only to see the story revealed in small chunks and even then the effect is esoteric to say the least. We get fleeting glimpses of what goes on in the convent, in the same way that the audience listening to the girls perform see only the occasional glimpse of the young women in the shadows behind the grille. I found it difficult to get along with the presentation of the narration; there are no defined chapters and it the narration moves imperceptibly between letters and diary entries, a feature that I found confusing at times. Shaun Whiteside’s translation reads well but such is the dreamlike nature of the story that I can’t help thinking I’m missing something by not reading it in the language in which it was written. I can see exactly why many readers will love Stabat Mater but for me it’s just too stylised and relies on creating impressions whereas I prefer to read something a little more ‘real’. No Comments on "Stabat Mater"